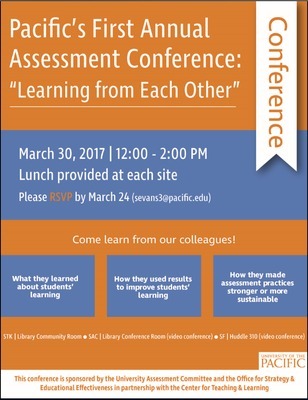 Pacific’s First Annual Assessment Conference: Learning from Each Other exemplified Pacific faculty and staff’s deep commitment to our students’ well-being and educational success. Held on March 30, the conference showcased seven different assessment projects that Pacific faculty, staff and students have conducted to improve students’ learning, retention, and quality of life on campus. Projects ranged from improving campus safety, improving expert-level reading skills, and enhancing leadership and critical thinking, to evaluating the impacts of exam software, improving success of students with disabilities, strengthening writing skills, and improving supervisor evaluations of students. The event was a successful collaboration between faculty, staff and students on the SF and Stockton campuses. The videoconference included lunch at both sites followed by live presentations and discussions, plus a poster presentation on assessment research by one of our graduate students. Professors Kirk Land and Justin Low chaired the conference. It was co-sponsored by the University Assessment Committee and the Office for Strategy & Educational Effectiveness in partnership with the Center for Teaching and Learning. Our thanks to the faculty, staff and student presenters whose inspiring assessment research made this conference a success! We look forward to next year’s conference.